World-wide Muslim groups have condemned the carnage in Mumbai. Each of these is, for me, a candle in an emerging new menorah, reflecting the Tree of Life to which we all aspire. Virtually all of these groups treat all peoples as humanity in their messages and do not single out individual groups among the slaughtered, wounded and networks of traumatized families and communities. May we be blessed for this to be a step in the direction of terrorist attacks on Israel, which a few such groups have condemned, but only very few. Equally so, increasingly Jews are taking responsibility for speaking out against toxic behavior by Israeli fundamentalists and extreme governmentally sanctioned military actions. Menschlichkeit as well as change would make excellent terms to mark the new era we are entering. May we be so blessed. As many commentators in various media have noted, each of us struggles to grasp the horror of the human toll for all affected, while also feeling keenly for our own religio-ethinic group connection to the Mumbai event. The attack on a Chabad House is too specific to say it’s petty to feel Jews were specifically targeted. India was one of those places one could feel safe to be a Jew, where Israeli youth in droves take intersession breaks from military and college. A country where Jewish spiritual seekers have long found a respectful reception in Hindu ashrams while many a guru would eventually, gently suggest one also needs to understand, appreciate and practice from within one’s own roots in Judaism. Often as a frontier rabbinic worker, whether in rural America, the Ukraine or Africa, Hassidic rabbis have been friendly colleagues in the field. In the Ukraine, the Squarer Rebbe Twersky upon listening to my teachings on mikveh at his amazing designer mikveh there, told my students: “Don’t call her Goldie, show respect to your teacher, call her Reb Goldie.” In Cape Town, we were immediately invited for tea and Torah by the Chabad rabbi, and then again seated as a guest of honor for Shabbos dinner, in Reading, PA. I’ll never forget the poignancy of my husband, no stranger to tefilin, telling a young Breslover in Sefat last year, that he would put on tefillin with him if the lad would read Victor Frankl’s Man’s Search for Meaning. The fellow went running to get his Rav’s permission – and received it! And so on, in Venice’s historic ghetto, France, and England. Yes, in recent years polemics most notably outside North America against non-Orthodox rabbis by Chabad leadership and efforts to continue rules preventing us from equal rabbinic work and stature have significantly ruffled the health of klal yisrael, Jewish peoplehood, because ahavas yisrael, the mitzvah to love each other has proven extremely difficult to manifest for many. 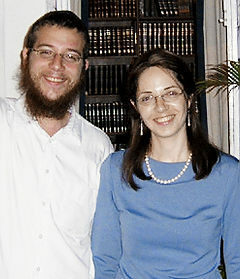 I prefer to remember the caring hosting, which makes it so easy to imagine Rabbi & Rebbitzin Holtzberg of blessed memory, the Mumbai Chabad couple in their ministry. Who among our people could not take notice? Mutual vilification and blame is easy in world affairs. Menschlichkeit is harder to offer in challenging times and even more difficult to get into the press. Being careful what we believe about each other is so central to attaining peace. On one local discussion list users just this week wrote these parallel stories…. How does the listener from the other’s culture discern between what they believe is true and what is factual? Rabbi Dr. Goldie Milgram, MSW directs ReclaimingJudaism.org and Bmitzvah.org. She presently teaches Bioethics, Halachah & the Role of Jewish Clergy for the Aleph Ordination Program. She has authored many works including the January 2009 release, Living Jewish Life Cycle: Creating Meaningful Jewish Rites of Passage at Every Stage of Life (Jewish Lights Publishing). To view previous editions of "Living Judaism", please click here.